Head to the End of Time through the nearest time gate, you technically begin this chapter in Medina so that would be the closet in one of the houses. 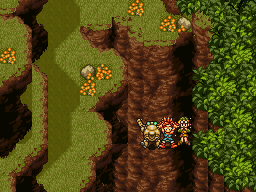 Remember to keep fighting Spekkio whenever Crono builds another 10 levels, because you won't have a chance for a while once this chapter begins. Gaspar will finally say something new when you go to the End of Time, and tell you that Dreamstone is a prehistoric mineral, so you might be able to find some in the prehistoric era. Anyway, now's the time to check out the gate to 65M B.C. You could have gone before of course, but you wouldn't have been able to do much yet. Falling in the Far Past. A lot of the monsters in this era are weak against lightning so if you have Lightning 2 you're golden, but if not you'll still be fine with the regular lightning spell. Don't worry about it if you don't have it, Chrono Trigger really isn't a game where it's worth your time to level up deliberately, you can always just repeat the game with a new game + and have more fun with it. As soon as you take the portal into 65M B.C., you'll start out with a bunch of fights, so pick some party members with multi-enemy techs. Equip the Rage Band and the Silver Stud to be able to counter-attack and make using spells easier. You'll fight two group of reptites, and Ayla will help you out, and introduce herself. Ayla give a Party for the new Friends. Follow Ayla to the Exit and on the way pick Berserker from the chest. You can go in a few of the huts to talk to people if you want, or even check out the hunting range although you can't trade items yet, but eventually you'll want to go in the "Chief's Hut" and talk to Ayla to try to win some Dreamstone. 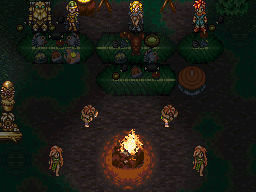 Talk to the party members you brought with you to the party, and wait until they stop moving around and you can compete with Ayla for the Dreamstone by pounding . Apparently that jungle beat in 1000 A.D. is older than you'd thought. Do some button-mashing, and you'll wake up with the Dreamstone... but without the Gate Key. You may be able to get The Unknown Past Ending at this point. In any case, this ending shows a few scenes from 65M B.C., since you haven't had the chance to go there yet if you beat the game at this point. This page was last edited on 18 October 2014, at 15:33. This page has been accessed 96,792 times.